And so... these Learned Men, having Inquir'd deeply into the Case for the Opposition, discover'd that the Opposition had no Case and were Devoid of Merit, which was what they Suspected all along, and they arriv'd at this Happy Conclusion by the most Economical and Nice of all Methods of Enquiry, which was that they did not Invite the Opposition to confuse Matters by Participating in the Discussion. That is why I have reluctantly rejected the centrism that Patry still desperately tries to embrace in this debate. I actually sympathize with it to an extent, but the world copyright cartel [!] has metastasized in such a way that it makes reasonable compromise all but impossible. I suppose that the participants of the Boston Tea Party were law breakers whose actions were condemned in many quarters at the time. I see the file-sharing community in the same light and hope they can help lay the groundwork for a much needed revolution. A "revolution" that would allow Mr. Levine to pick up copies of Blizzard of Oz, the Remains of the Day, and HALO 2 -- for free! Commercial entertainment products want to be free! Let's think about this identification of Mr. Levine's. The participants of the Boston Tea Party were British colonists who were being taxed by the British Parliament -- without having any representation in that legislative body. It wasn't the tax itself; American colonists were actually paying less for tea than (some) British subjects living in England. It was the principle that no free Englishman ought to be governed by a body that refused to allow him the same voting rights that all other Englishmen have. Justin Levine sees that as analogous to a fully representative government protecting the property rights of the creators of intellectual property, including their right to dispose of that property as they choose... including selling or leasing those rights. In other words, Justin Levine opposes Capitalism and urges a wave of theft by a gang of moochers, parasites, and freeloaders... theft that targets writers, musicians, filmmakers, software designers, and other fairly vulnerable creative artists, who for the most part do not themselves have the wherewithal to go after the nihililst thieves. And he compares these parasitical freeloaders to the Founding Fathers of the American constitutional republic... who, by the way, were so concerned about intellectual property rights that they actually included copyright and patent in the United States Constitution (article I, section 8, paragraph 8). I strongly urge everyone reading this post to follow the link above to Justin Levine's post and leave a comment expressing just what you think of him leading a cheer for thieves and leeches and calling for more, more, and ever more theft, a veritable "revolution" of robbery. Oh, wait; you can't: Reflecting his passionate devotion to the libertarian ideal of rational debate, Mr. Levine closed comments on the post the moment he posted it. You know... that sounds remarkably similar to the rhetorical approach of Squeaker of the House Nancy Pelosi (D-Haight-Ashbury, 93%) and Senate Majority Leader Harry "Pinky" Reid (D-Caesar's Palace, 85%). But perhaps that's just me. We can't use any product associated with Big Oil; that includes oil drilled from ANWR, the OCS, the G. of M., international waters, or even existing (productive) wells in CONUS; we cannot use shale oil; we cannot import gasoline or deisel; we cannot use natural gas; and we cannot use oil made by liquifying coal, because fossil fuels send the deadly poison CO2 into the atmosphere with devastating, disastrous results. We cannot burn coal directly, because that, too, contributes to global warming. And besides, what about black-lung disease? We cannot use solar panels, because they disturb the fragile desert ecosystems. When one suggests that even if a country fully commits to switching to "green" energy (which in this case means both "environmentally friendly" and "new and untested"), we must generate energy somehow in the meanwhile seems to elicit rage and fury, as the 'mentals angrily deny that we need do any such thing. But surely they cannot imagine that we can live without any energy at all... so what are they thinking of to replace our current oil-based economy during the transition period? And then it hit me on Government St., halfway between the Gray Line bus depot and the Bon Rouge boulangerie and bistro: These radicals don't believe there is going to be any lack of energy at all. Sidebar: For decades now, I have been hearing of a very particular conspiracy theory -- that someone (usually described as a small, private inventor) has created a magic pill; you fill your car's gas tank with water from your garden hose, toss in this pill, and voila! you get a cool 50 miles per gallon (or 100, or 150, depending who's telling the story) from straight water plus the magic bullet. But of course any conspiracy needs a villain; in this case, Big Carbon is frantic about this invention, because it would put them out of business. Even if they sold the pills, they wouldn't make the hundreds of billions of dollars they currently get from fossil fuels. Therefore, goeth the conspiracy, the petrol producers have "suppressed" this invention. It's non existence on the shelves of Pep Boys and Kragen has nothing to do with the chemical impossibility of turning water into an inflammable substance -- and everything to do with wicked multinationals (Halliburton!) that have covered up the greatest invention since movable type. All right, you're way ahead of me; but I'll say it anyway: The revelation suddenly consumed my brain that these extreme environmentalists must have fully bought into this conspiracy: They believe that by denying Big Carbon all the quick fixes and low-hanging fruit of the oil economy, the scoundrels will be forced to reveal this invention, just to keep their heads above Davy Jones' water. 8 All's right with the world! We already see a deep nexus between leftish radicalism and conspiracy theory; for three uncontroversial examples, consider how many radicals passionately believe that we went to war with Iraq to steal its oil, that George W. Bush "stole" the 2000 and 2004 elections, and that the World Trade Center and part of the Pentagon were brought down by "controlled demolition." While this doesn't prove environmentalists believe in the water-to-gasoline magic pill, it eliminates the best defense against swallowing such tommyrot: common sense. Again, this is not proof, but it's provacative: If you assume my supposition above to be true -- that the enviro-wackos believe Big Carbon is sitting on an invention that would get us through the "seven lean years," and that the oil barons will be forced to reveal the secret elixir that replaces gasoline and gives us limitless energy with no pollution and no hard work -- it's amazing how many other leftish, Earth-worshipping policy issues fall out easily, from "sustainable food," to the Kyoto Protocol, to "animal liberation," to the reforestation of the entire North American and European continents. I think the Earth First (Humans Last) leaders especially would insist that B.O. -- Big Oil, not Barack Obama -- really has committed exactly that "intergenerational crime" "against humanity and nature"... but only if you got them drunk enough to forget their political inhibitions. Just a wild, hippie-dippie speculation; take it for what it isn't worth, which is the paper it isn't printed on. 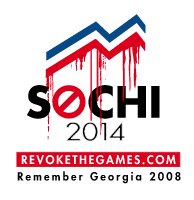 You can see it in all its glory (and embed it, whatever) here. 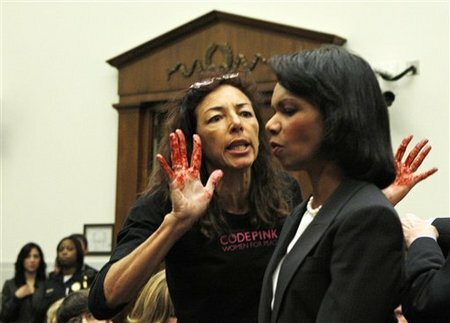 I first heard about a Code Pink member "confronting" (that is, unsuccessfully trying to intimidate) Secretary of State Condoleezza Rice, as the latter entered a House Foreign Affairs Committee hearing on the Israel-Palestinian Authority "road map." Something seemed wrong about the confrontation, where the aptly named Pinko waved her red-painted hands in Rice's face while Rice entered the hearing room. Rice, of course, simply walked right on past without cringing or even reacting. (Had the Pinko actually tried to grab Condi, I think even Condi-haters suspect the protester would have gotten a Secretarial fist in the face.) But the picture crystalized what disturbed me when I first heard about this: This clearly is not out on the street, it's inside the Capitol building. Nobody is standing in between the protester and Secretary Rice... despite the fact that the woman is wearing a Code Pink t-shirt and has her hands painted bloody red. What, nobody suspected a thing? There were numerous other Code Pinks in the area, all wearing trademarked Code Pink type clothing; in the audio, they join in the assault on Rice almost at the same moment, screaming "war criminal" as they lunge at her... and it's some time before the police can be heard trying to haul them away. Look in the lower-left corner of the image: A Capitol policewoman stands watching the confrontation but making no move to intervene. Even if we assume she's just slow on the uptake -- why wasn't she already keeping an eye on a group of people known throughout the town for their disruptive, confrontational, and at times violent protests against Bush administration officials? As the chief law enforcement officer of the House, the Sergeant at Arms is responsible for security in the House wing of the United States Capitol, the House office buildings, and on adjacent grounds. Under the direction of the Speaker of the House or other presiding officer, the Sergeant at Arms plays an integral role in maintaining order and decorum in the House chamber. The Sergeant at Arms is also responsible for ensuring the safety and security of Members of Congress, congressional staff, visiting national and foreign dignitaries, and tourists. Toward this mission, the Sergeant at Arms works in concert with the Senate Sergeant at Arms, and the Architect of the Capitol. These three officials, along with the Chief of the Capitol Police in an ex officio status, comprise the Capitol Police Board. Rice's testimony was punctuated by Iraq war protesters. As Rice entered the hearing room, one woman rushed toward her and waved her hands - painted blood red - in front of the secretary's face. The protester shouted that Rice was a "war criminal" and should be taken to The Hague, home of an international war crimes tribunal. Rice was stoic and continued with her business as the protester was removed. Others were likewise escorted away at the behest of Rep. Tom Lantos, chairman of the House Foreign Affairs Committee. If you'll recall, a similar event occurred a couple of weeks ago, when a Senate Appropriations Committee hearing (I believe), chaired by Sen. Robert Byrd (D-WV, 80%), was disrupted by Code Pink; the disruption was allowed to continue for some time before Byrd attempted to restore order. In that case, the protesters actually unfurled a huge banner; it's hard to imagine how such an item could have been concealed... was it hidden in a protester's purse? And it keeps happening over and over again, with MoveOn, Code Pink, NARAL, anti-"globalists," ELFs and ALFs, International ANSWER, and the entire panoply of whacko environmentalists, peaceniks, Stalinists, and the rest of the army of the perpetually aggrieved. They yell and chant, weep and wail, threaten and frighten, pitch tantrums, and often assault their opponents with various food items, like a bad Monty Python impersonation. Are we supposed to believe that each and every time, the Capitol policing authorities are caught totally wrong footed? That they never see it coming? It never occurs to them that obvious members of an organization known for violent, disruptive protest -- might perhaps be present in force to hold a violent, disruptive protest? Perhaps I'm imagining conspiracies everywhere, but it honestly seems to me as if the Democrats are deliberately allowing obvious Code Pink protesters into the gallery -- and now even into the areas through which administration officials must pass in order to testify -- and encouraging Code Pink's thuggish harassment of Republicans and even moderate Democrats. Democrats evidently think they can win debates by using pet goons to frighten their opponents. I believe they have instructed the House Sergeant at Arms to allow such protesters into the galleries and hallways, and to let them go on a while before making an attempt to shut them up. I believe the Capitol Police have been told in no uncertain terms not to interfere. I don't want to make the obvious historical comparison. To me, this is an unambiguous attempt at politics by physical intimidation, a tactic Democrats may well have learned at the knees (or kneecaps) of their mentors in the labor movement; in that realm, such intimidation, brutal violence, and even assassination are well-worn tactics, due to mob influence and the criminal mentality of many union leaders. It doesn't appear to work on administration officials, but it may explain some defections by Republican legislators, some of whom (let's face it) are creampuffs. But even if this could be proven, would the reaction by left-liberal Democratic voters be revulsion and condemnation -- or cheers and applause? Power to the people right on! My response (I love this) is entirely contained in the list of categories I had to attach to this post. The fact that the same Republican candidates who want to keep 160,000 American troops in the middle of a civil war couldn’t agree that we should take out Osama bin Laden if we had him in our sights proves why Democrats want to turn the page on the last seven years of Bush-Cheney foreign policy. Yes it does; it indicates ("prove" is too strong a formulation) that to Democrats, the war on global hirabah begins and ends with Osama bin Laden: To the congressional majority, we can win everywhere else; but if bin Laden isn't captured and prosecuted, we have lost. But even more ominously, we can lose everywhere else; but so long as we capture bin Laden and put him on trial (in the U.N.'s International Court of Justice at the Hague, of course), then we've won! Such juvenile thinking permeates the Democratic party more thorougly than Shiite militias have penetrated the Iraqi National Police. Another example, just enunciated by Max Boot in an interview on Hugh Hewitt: the unreasonable demand put upon Prime Minister of Iraq Nouri al-Maliki to ram reforms through the Iraqi parliament... when we, ourselves, deliberately wrote their constitution to weaken the prime minister, back when our greatest fear was another Iraqi "strongman" rising to replace Hussein. We weaken the prime minister, then imagine that if only we replace Maliki with another guy, he'll be able to solve the political problems ("Daddy fix!"). And when the policies they demand (or inflict upon the American people) collapse, leaving a shattered industry or sector as testament to Democratic fecklessness... their only explanation is to shrug and say, "it seemed like a good idea at the time." Republicans and GOP-leaning independents have it in their power to prevent another Peter Pan presidency. And the first step is to stop forming a circular firing squad at the drop of a disagreement. To quote that great small-f federalist, one of the authors of the Constitution, and perhaps the greatest epigrammatist in American history -- I refer to Benjamin Franklin, of course -- "gentlemen, we must all hang together, or assuredly we shall all hang separately." And in the fullness of time, both the Democrat-controlled House and the Democrat-controlled Senate broke with longstanding Democratic tradition and decided to support the United States of America. Silly bit of business, really; foreigners calling foreigners whose calls happen to be routed through nodes in Los Angeles or New York, and the National Security Agency was listening in when it appeared that one or the other foreign party was a terrorist, a terrorist supporter, or a terrorist harborer. But the Foreign Intelligence Surveillance Court opened the Devil's gate by deciding that this violated some obscure clause of the Constitution of which we were all previously unaware: the constitutional right of privacy for all foreigners living abroad. A judge -- they won't say who -- struck down the program. Gleeful Democrats charged into the breach and demanded that President Bush submit all proposed "wiretaps" to a judge, present their "probable cause," and sit back and wait two or three weeks until he makes his decision. And if the four hundred year old judge doesn't understand why it's important to "wiretap" some radical cleric in Waziristan talking to young Moslems in Westminister, then it's back to the drawing board for the NSA. But the Old Texan called their bluff. He argued that protecting Americans from terrorism required gathering intelligence. He pronounced that foreigners living outside the United States have no rights whatsoever under the American Constitution. And he insisted that the people's business was more important than Congress' vacation plans. Bush proposed that the decision to surveil be made by (here was the compromise) both the Attorney General and the Director of National Intelligence... thus keeping it within the Executive branch, which has sufficient energy to make a decision and act upon it, rather than endlessly debating the question (as the Legislative branch does) or consulting accumulated decades of hoary "wisdom" (à la the Judicial branch); but also not leaving the decision solely to the discretion of Alberto Gonzales, the Democrats' current Great Satan. Yet they daren't be seen putting off American national security so they can go home and scarf up more campaign contributions and distribute more pork-laden earmarks. At last, Democrats in both chambers of Congress arrived at the same conclusion, which they enacted and sent on to the president for signature: They caved to the Bush plan to reform the nearly three decade old FISA, thus betraying the MoveOn, George Soros, Daily Kos wing of the Democratic Party (they've been flying on one wing for seven years now). But then, in an agony of cleverness, they set things up so their surrender to the Bush plan will only last six months... at which point they'll have to go through the entire nightmare all over again, navigating the narrow passage between the six-headed snake and the greedy whirlpool, to finally arrive right back to the same bill they just approved six months down the road (with or without yet another sunset clause). That means that the next time Congress faces either infuriating "the Democratic wing of the Democratic Party," or else alienating those Americans who care anything about national security, it will be at the end of January and beginning of February 2008: Exactly when more than 50% of American voters go to the polls to decide the presidential nominees -- in the states of Iowa, Nevada, New Hampshire, Florida, Alabama, Alaska, Arizona, Arkansas, California, Colorado, Delaware, Georgia, Idaho, Illinois, Missouri, New Jersey, New Mexico, New York, North Dakota, Oklahoma, Tennessee, and Utah. Brilliant planning, Democrats; somebody didn't have his PDA turned on when the donkey party agreed to that calendar! I'm sure a massive debate about whether or not the Democrats care a fig about national security won't affect people's primary voting; just as I'm equally certain that the looming primaries won't in any way affect how Sens. Hillary Clinton (D-Carpetbag, 95%) and Barack Obama (D-IL, 95%) will vote on the terrorism-intelligence bill. How do the Democrats always manage to get themselves into a pickle like this? Oh, wait -- maybe their complete lack of "the vision thing" or any set of moral principles has something to do with it. And Michelle missed the big picture, anyway. Last Thursday, Dafydd and I [that's your only easy one] were watching one of our favorite TV shows, So You Think You Can Dance -- a dancing version of American Idol, where contestants vie to be chosen "America's favorite dancer." It's a truly great show: The dancers come from many different disciplines, from ballroom to B-boy, Latin to Hip-Hop... and everybody is required to dance every style. On Wednesdays, we see the contestants (paired up boy-girl, boy-girl) randomly choose a dance style. For several days -- covered in a minute or so of short video takes -- they're choreographed by professional choreographers; then they take the stage and dance the routine. Thursday is the result show, where, on the basis of viewer votes the preceding day, one guy and one doll are cut from the show. Thursday is always a nailbiter; we have two favorites, Lacey Schwimmer and Pasha Kovalev. Lacey is a West Coast Swing and International Latin ballroom champion -- just like her brother Benji Schwimmer; in fact, besides the official championships he's won, Lacey's brother Benji also won this very competition last season. Pasha is also Latin ballroom, but I don't know if he has ever won any major competitions; he doesn't mention any in his bio. But then she opened the messages and was shocked by their tone and content. "It was hate mail," she says simply. "Saying things like, 'You should be ashamed of yourself.' It was really intense. It was awful." The writers were responding to a jacket worn by Michaels on Wednesday's show. She had no idea that anyone would be offended by it, she says. She simply thought she was being fashionable by wearing a navy blue military jacket that happened to have a Marine emblem, upside down, on the sleeves. After hearing the feedback, Michaels tried to make amends on the air. "I understand why people were upset and I respect that," she says. "That symbol is sacred to the Marines, it's what they earned. The problem needed to be addressed and I'm glad we addressed it. That's why I made a public apology." Although her on-air apology sounded sincere enough, the "hate speech" comment is utter bilge. Soon after Thursday's show, I went to the show's bulletin board (and so did I). There were already over two hundred posts in one thread on Mia Michaels' wardrobe, and there were at least a dozen threads. The comments were mostly from Marines, their friends, and family members criticizing Micheals' insensitivity... plus a bunch of ardent, anti-war fanatics posting to call the Marines "chickenhawks" and "warmongers," racists and homophobes, and to order them to stop watching the show. I did not see a single instance of hate speech, though -- at least not on the pro-war side. The threads have all scrolled into oblivion, and we of course can't be sure that Mia Michaels didn't receive any bona-fide hate snail-mail; but the first few BBS posts I read were from Marine Corps sergeants simply explaining what that uniform meant to Marines, and how hard people must work to earn the right to wear it. It isn't something you casually wear to look cool. Many such posts followed; and of course, each thread degenerated into an argument over the war itself. But honestly, if Michaels had understood why people were offended, she wouldn't have interpreted "you should be ashamed of youself" as "hate mail." Both Wade and Mia have been nominated for an Emmy in the past. I usually don't care for Michaels' pretentious, meaningless, "artistic" style of Contemporary, but Wade is different: He has a distinct style, he's creative and unique, and his dances are generally just plain fun (if you watched last season, he choreographed the "night of the living dead" group number). Just as Bob Fosse's choreography was unique and instantly identifiable, Wade Robson has a personal touch that makes him stand out. We were exasperated. Why did he have to inject his naive political opinions into an otherwise a-political famility entertainment show? My opinion of Robson plunged. That put executive producer Nigel Lythgoe in the crosshairs of more angry feedback from those who believe that an antiwar dance means the show and its dancers are unpatriotic and do not support the troops [gosh, I wonder why people would get that impression]. "Who would've dreamt -- with the dancers using words like 'humility,' 'love' and 'passion' -- that I would be defending a television show that uses words like that?" asks Lythgoe, who also apologized on air. But at the same time, Lythgoe stood his ground. "Art should be allowed to make statements," he said. "I'm so proud to be part of a show that allows freedom of expression," says Michaels. "Nigel has allowed us to be who we are. He never edits us and he lets us express ourselves as artists. I think that is rare and extraordinary." Really! Does anybody believe Nigel would have allowed a choreographer to create a dance routine with a theme of "moral war," the dancers wearing T-shirts stenciled with words like "victory," "courage, and "honor?" Show of hands now...! Being political junkies, we're used being ambushed by the Left in the most inappropriate venues: my junior-high math teacher’s retirement party, my best friend's wedding -- and even a dance contest show. It's amazing how often we're forced to endure asinine, leftist political commentary shoehorned into some venue where arguing back -- or even hinting at disagreement -- would create such a scene, that we just keep our mouths shut. I think everybody reading this post knows exactly what we mean. "Who doesn't want peace, anyway?" Nigel demanded on last Thurday's results show, reacting to the criticism. He seemed truly taken aback by the viewers' response, honestly befuddled that anyone would see anything wrong with protesting against war -- during a war. Fortunately, I missed last week’s episode of the Fox network show, “So, You Think You Can Dance?” If I had seen it, I might have damaged my TV set. She is right, of course; but she missed the big point: It's one thing for conservatives and milbloggers, who normally don't watch the show anyway, to complain about it after the fact. But it's quite another when ordinary, non-political dance fans get offended by what they consider an "anti-military" message. The endless threads on the show BBS were clearly started by big fans of the show who watched it twice every week, but were so offended that they complained. That's more than we jaded politicos did! And that's the big picture that Michelle Malkin missed: It wasn't just the "usual suspects" complaining; it was a major chunk of the show's viewership. Enough to spawn, not one, but two apologies on the same prime time, network show. We've been told so many times that since "70% of Americans are against the Iraq war," the rest of us should just shut up and blow away. We're lectured that Americans are sick and tired of this long, fruitless war that can only end in ignominious defeat. But when a popular TV-show sneaks “anti-war” propaganda against this selfsame “unpopular war,” they receive hundreds of complaints. What gives? Is it possible that ordinary Americans are not as anti-war as the elite media portray them, not quite so willing to embrace defeat and surrender? I don’t know if I should leap that far to a conclusion based upon one reaction to a TV dance show... still, what happened on SYTYCD could be a harbinger of things to come. It is just possible that what the American people are really sick and tired of is the relentless drumbeat of losers insulting our military. Maybe what people really can't stand is defeat. So if they think (based upon media lies-by-omission) that we're losing the war, they're against it; but if they understand that we've turned a corner and are now headed towards a reasonable victory with honor, we may see a complete 180 on whether it was worth fighting the Iraq war. As the expression goes, "Victory has a thousand fathers; defeat is an orphan -- living on generous welfare payments from Democratic surrender-monkeys." If that's the case, then when General David Petraeus brings home good news from Iraq this September, the American people will look back at Democrats who spent the last couple of years pushing retreat-defeat resolutions and, like the guy or gal waking up after a drunken, quickie marriage in Tijuana, wonder what the hell they ever saw in Harry or Nancy.